Every game-lover grows up dreaming of meeting someone, getting their own place, decorating the spare bedroom, and turning it into a super-hot games room. Right? We fantasised about banks of machines on each wall, bright colours and pixelated monsters at every turn, neon lights and chiptunes assaulting players from the second they walk in. Yes, okay, there will be some initial outgoings, but your partner is missing the bigger picture – leave this machine coin-operated and this could be the greatest piggy bank you ever buy. Saving up for that holiday abroad? Hoping to do the house up? If you play three games a day for £1 per play, that’s nearly £1000 saved just in the first year! If they don’t seem convinced, try spreadsheets. Everybody loves spreadsheets. Houseproud spouses would do well to remember that vintage and retro furniture is back in style, and those Double 7 machines are making a splash in all the best contemporary homes right now, cleverly disguising themselves as coffee tables. All you need now is a few Space Invader decals and you’ve got yourself a hint of the games room you once dreamed of! What other games console practically forces you to stand up while you play it? Other than the odd Wii game, it’s hard to find something you can’t hack so that you can play from the comfort of your sofa, but a tall arcade cabinet demands a little physical work from yourself. Use it as a warm up or cool-down after exercise, and convince your partner that you’ll both spend more time moving around if you just play one more round of Super Breakout. Yes, it’s also good for your mind. Jane McGonigal, researcher of games and author of the book “Reality is Broken: Why Games Make Us Better and How They Can Change the World” found that a couple of hours of videogames every day can improve your reasoning, spatial awareness, problem-solving and general mood. They also increase your mental and emotional resilience, creativity, determination and focus. That’s a lot of good stuff to come from one shiny box! 6. It’s really, really good for you! This could be a pro or a con depending on how much your partner loves kids, but friends’ and family’s children will soon find hours of entertainment when visiting your home, leaving you and the rest of the adults in relative peace and quiet. You might have to prepare to see your high score board fill up with rude words – but that’s just extra incentive to beat them all again. The other pull, of course, is that most visiting adults will love the retro addition to your home – staying in will be the new going out, and all you need to do is stock up the fridge and get a few tournaments underway for the evening. 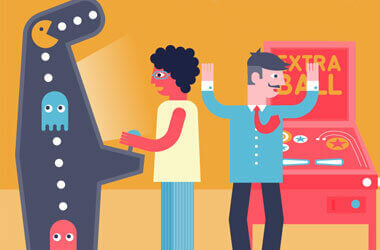 Many arcade machines come with a massive selection of games to keep everybody entertained, so it’s minimal stress for you whenever you want to host a few friends! These last ideas require a little bit of building and creativity, so if your partner likes to tinker, these are definitely the angles to go with. You can essentially build your own arcade machine with a cabinet, screen and computer – many people even use the impressively small RaspberryPi to make their own miniature versions. It’s thrifty and a lot of hard work, making it perfect for convincing those who like to take on a DIY challenge. Alternatively, you can buy your machine but turn the casing into an artistic project, customising everything from the stick and buttons to the casing itself. There’s a risk of voiding your warranty, but if your partner is looking for a new design project this could definitely be the way forward – especially if you’re willing to give them full control over the finished result! Of course, if all else fails, you can always convince a friend to get a machine instead. Or – well, we don’t endorse stooping to bribery, but the odd foot massage here, a delicious meal there, maybe a few surprises, they can make all the difference. Good luck – and if you do have a home arcade setup, we want to hear about it! 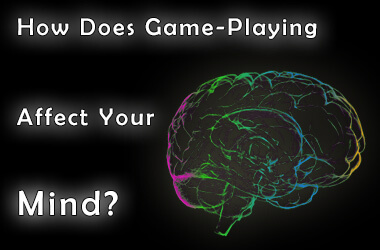 How Does Game-Playing Affect Your Mind & Body?